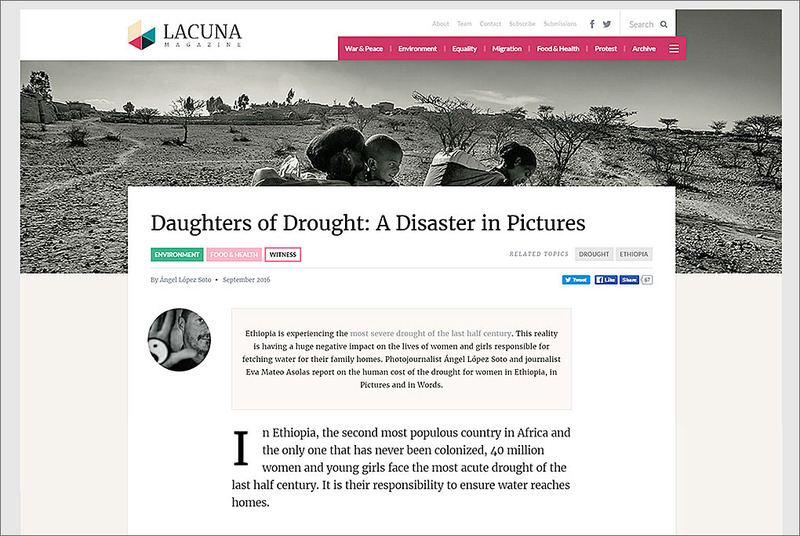 Ethiopia is experiencing the most severe drought of the last half century. This reality is having a huge negative impact on the lives of women and girls responsible for fetching water for their family homes. Photojournalist Ángel López Soto and journalist Eva Mateo Asolas report on the human cost of the drought for women in Ethiopia, in Pictures and in Words. 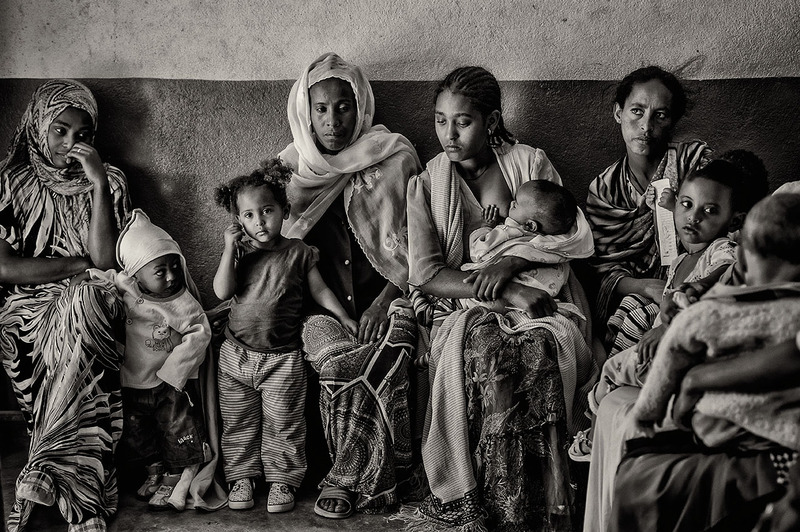 In Ethiopia, the second most populous country in Africa and the only one that has never been colonized, 40 million women and young girls face the most acute drought of the last half century. 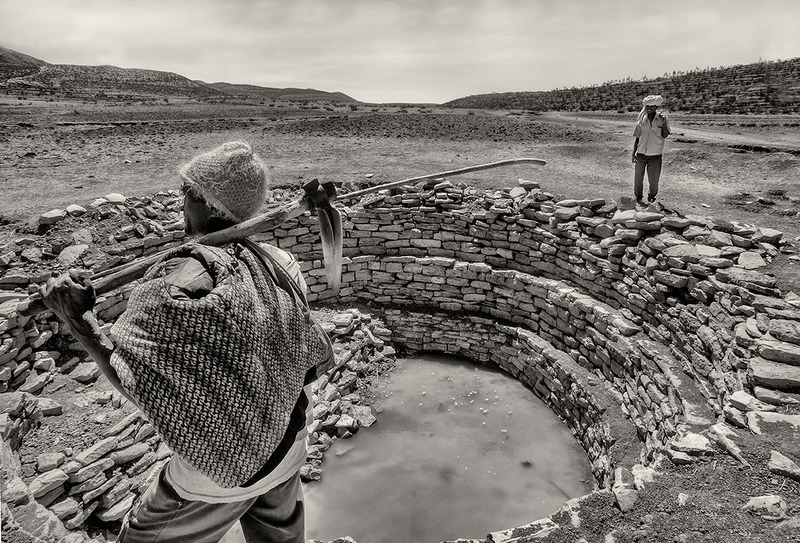 It is their responsibility to ensure water reaches homes. 8 out of 10 Ethiopians make a living from agriculture. In the past year they have lost up to 90% of the harvests because of the lack of rains over two consecutive seasons, known already as the worst drought of the last 50 years. You will give me seeds, won’t you? 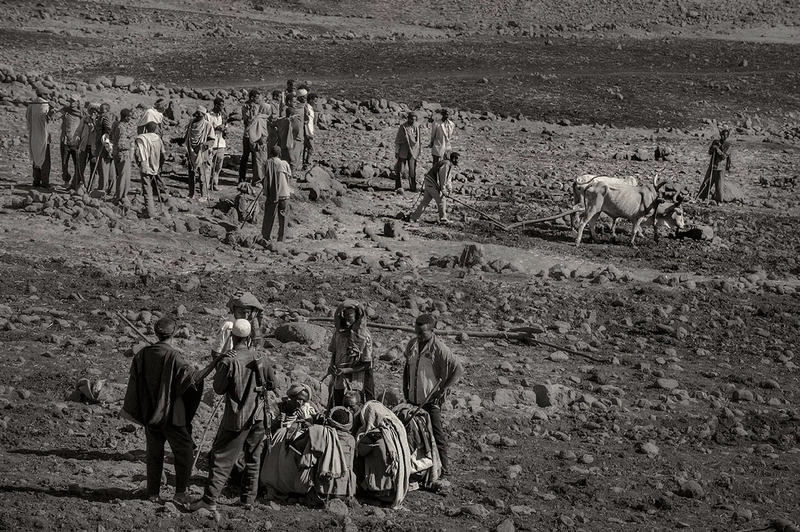 Abbadi asks us while he pulls an ox to plough his half hectare of rocky and dry land in Wukro. It is estimated that 7.5 million farmers urgently need aid. The country’s immediate future depends on this planting season. Ayuda en Acción has already distributed seeds to 2,000 families, although threats to basic necessities are multiplying. Emba Haliwo is an example of resilience. The mountain has terraced hill-sides which facilitate water infiltration, preventing it from accumulating on the surface and permitting the use of water for the crops.‘Both in drought and in floods, the strategy is the same: to retain the water to allow it to infiltrate’explains Leonardo Viaggi, a consultant expert in emergencies. In this area, on one side of Wukro’s highway, where camels go on a pilgrimage over 6 days to bring salt from the mines to the Aphar region, wells retain water from the terraces, but the lack of rains has severely reduced the water tables. 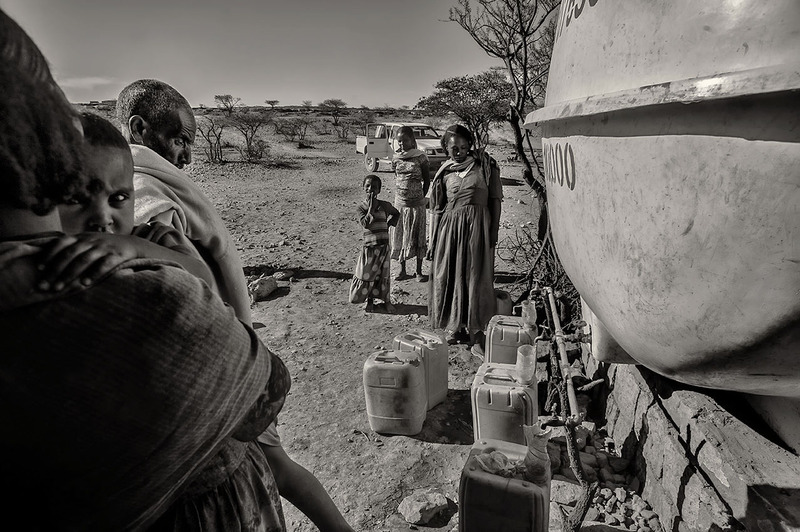 Ayuda en Acción keeps carrying out the water and seed distribution plan in Ethiopia, and the recovery of livelihoods for people like Abbadi, Yeshin, Sisay or Tsega and her children can be a struggle against a drought unknown to many in the rest of the world. 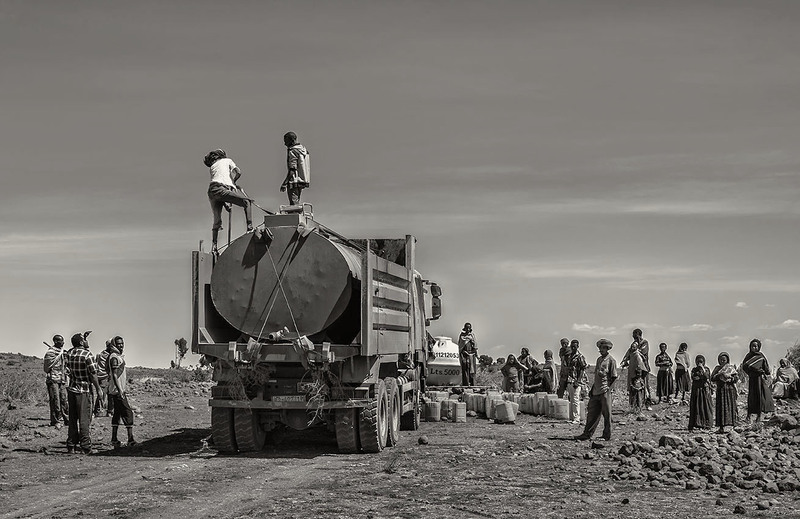 During the first phase of the emergency, taking water to communities was the first priority. Women and young girls, in charge of bringing water to the homes, stand in long queues with their jerricans (yellow buckets whose capacity is between 20 and 25 litres) at distribution points like this one in Mekane Birhan. 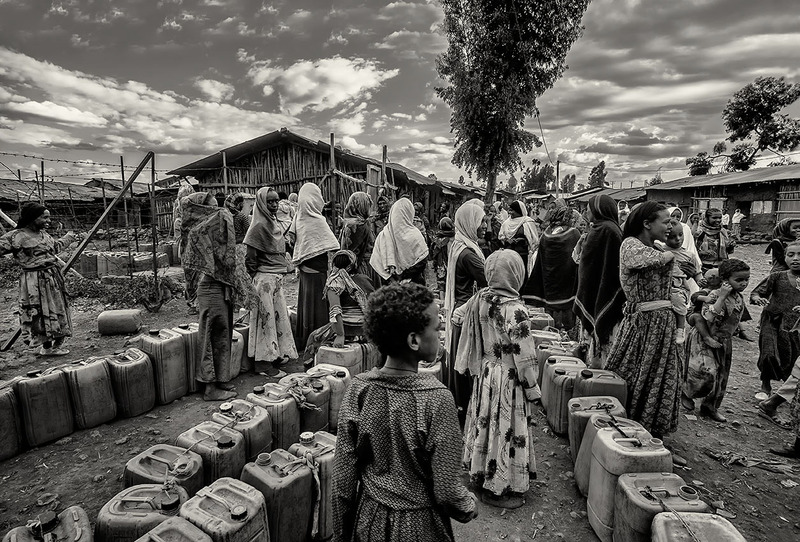 In Ethiopia only 2 out of 10 rural homes have running water and almost half are supplied by fountains and public wells. 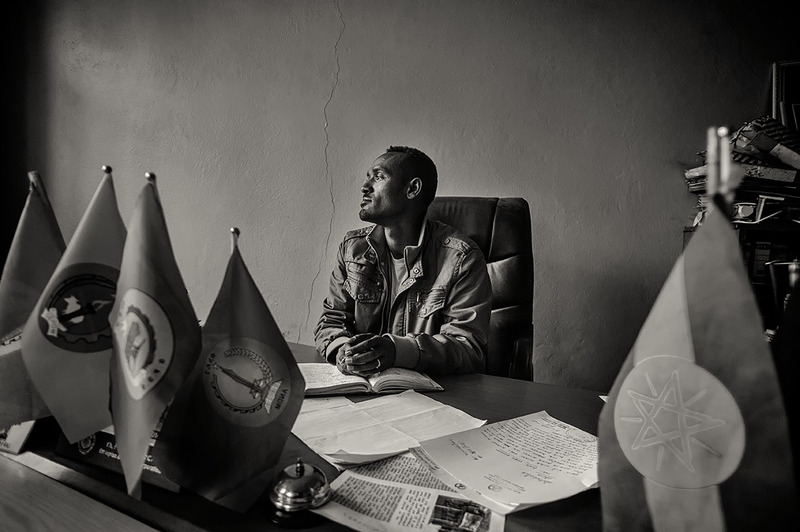 ‘I’m afraid that the rain never comes back’, confesses Yeshin Fante, a mother of 5 children, while waiting her turn to get this most precious resource. ‘Water is a women’s problem’, claims Wubalech Admasu, the woman in charge of Janamora’s Water Committee. In her area, each of the 14 fountains – supplied by 7 springs – provides water for 250 homes which contain families of, on average, 5 people. The water supply capacity has been reduced, for which they had to build new wells. However, only 1 out of 3 drillings is successful, and finding the resources to do it is not an easy task. Women who belong to water committees and local cooperatives periodically receive advice and training as in this communication workshop conducted by Action Aid, the Ethiopian counterpart of Ayuda en Acción. Not only are we drilling wells and delivering water in trucks with Ayuda en Acción, we are also distributing food to 72,000 people. Now, we desperately need to feed the animals so people don’t lose their main means of living. Sisay Demanu (left) explains at a water distribution point of Ayuda en Acción, the eldest man in his community at Awchara. That wish and those prayers are raised to heaven. `We pray each day for the rain to come´, affirms the orthodox priest Merigeta Hailemariam Gessesew (right), before singing a psalm at the entrance of a rural school in Killte Awaelo, where truancy has been increasing, because without food, children have no strength to keep attending classes. Ayuda en Acción’ s water truck supplies Awchara’s water tank, and every day it takes a route to a nearby river (which at first sight looks dried up) from which it extracts water. The river has a capacity of 10,000 litres and supplies 220 people. It is situated next to the rural school, which provides a good opportunity to distribute water after classes. According to several surveys, water projects are between six and eight times more effective when women are involved in their management. That’s why Ayuda en Acción has put women at the forefront of its administration, not only in water committees but also in its daily distribution. Each day, the women control the arrival of the trucks, inform the neighbours and make sure that the distribution is made in an equitable way. 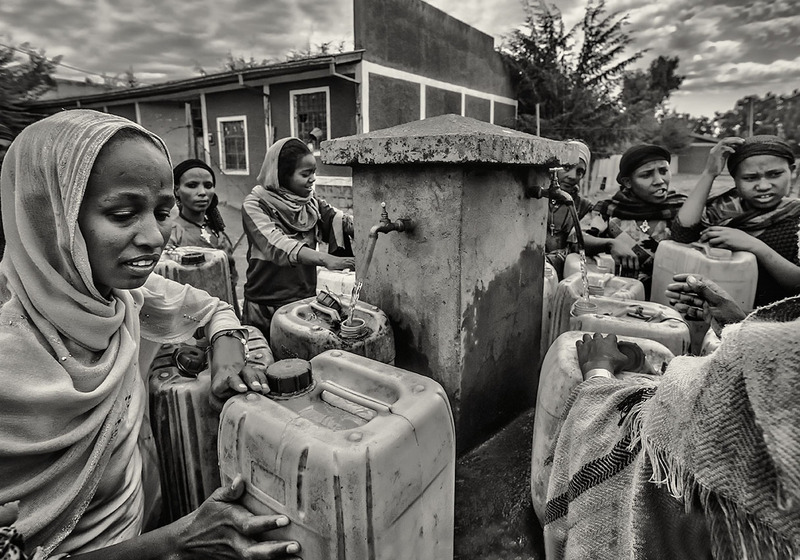 The organisation has provided water for 70,000 people in three priority emergency regions (Oromia, Amhara and Tigray). Women across the world invest 200 million hours a day in collecting water, almost a third of their working day. 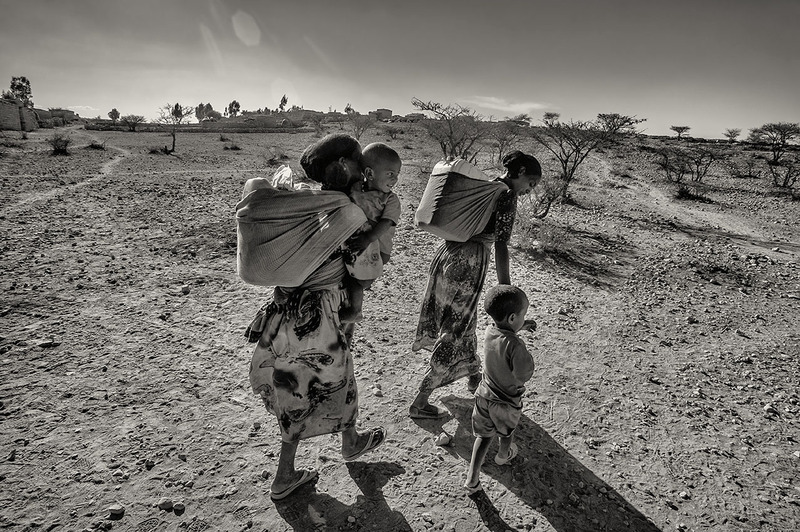 In Ethiopia it is not strange to see them walking for hours in the middle of uninhabited landscapes carrying their jerricans and their little children. This task, which starts at a very early age, often afflicts them with a displaced uterus and causes difficulties in having children. In addition, it prevents them from finishing their studies and assuming responsibilities that could generate income for the family. 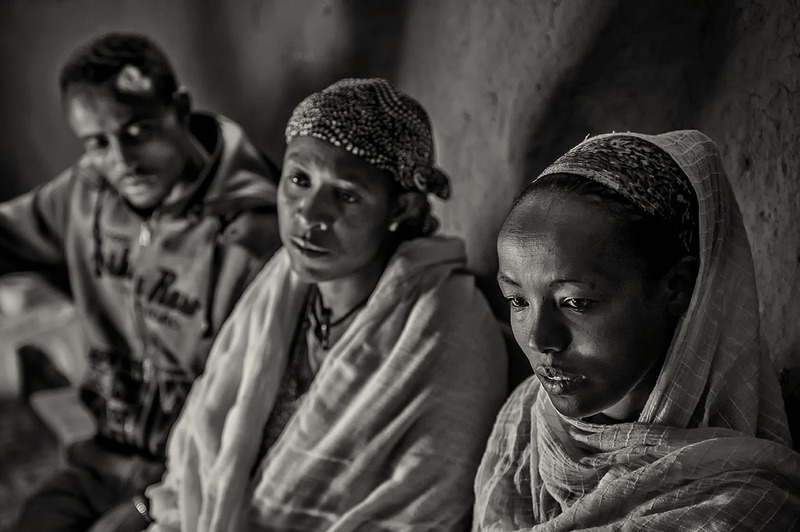 In Ethiopia, half of the women in rural areas have no formal education. Freweini Yigzam tells us, the nurse in charge of the nutrition unit at Kittle Awaelo’s Health Centre. Here, every month one hundred children are treated for moderate malnutrition, a problem that today affects two-and-a-half-million children and women in the country – not including the 450,000 children who suffer from severe malnutrition – and this has been aggravated by the extreme drought. ‘All I want in my life is health for my children’, says Tsega (left), 28 years old, with her deep jet-black gaze, while a nurse gives her a bag of nutritional supplements for her children, who just passed the weekly test. Melat (four-and-a-half years old) weighs 12.5 kilos and Milkina (one-and-a-half years old) weighs 8.5 kilos. They both weigh 30% less than they are supposed to according to their age, which can result in developmental disorders in the future and an unfavourable heritage for future generations. That is famine’s vicious circle.In the picture on the right a mother and her son are resting in the Pneumonia Area at Wukro Hospital.All photos by Ángel López Soto. 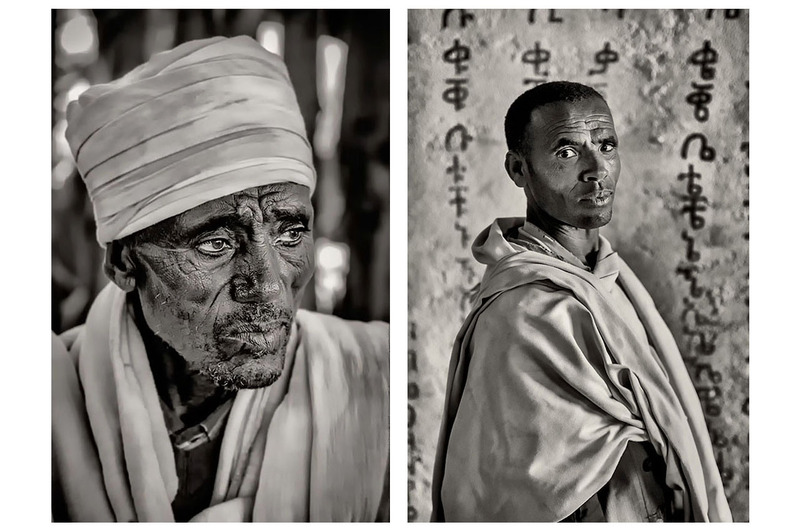 Angel López Soto’s reports and portraits have a profound approach to people and situations of conflicts. He has worked with organisations like UNICEF, Cruz Roja, Agencia Española de Cooperación Internacional (AECI), UNFPA (United Nations Population Fund), Ayuda en Acción, Action Aid and Fundación Vicente Ferrer.